Your BlackBerry can help you stay productive, regardless of how close you are to the office (or your home). These BlackBerry apps allow you to organize to your heart’s content, record your expenses and how you use your time, and more. You can use momentem to track call (or e-mail) times, for example, if you bill by the hour. It sits patiently on your BlackBerry, in the background, waiting for you to make a call, receive a call, send an e-mail, or receive an e-mail. It turns on a clock that records the event, down to the second — and then, as soon as you complete that task, a message pops up on your screen asking whether you want to tag that event. If you tag it, the app lets you assign it to a particular contact or a specific ongoing project. 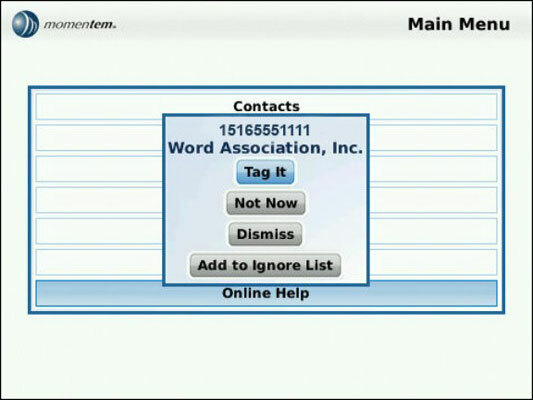 You can insert some notes about the purpose of the call or e-mail. And the system can also apply your billing rate to the task. Five minutes and fifteen seconds at $150 per hour? Why that’s $13.13 rounded up by half a penny. You can also add specific expenses and tie them to a client. And when it comes time for your clients to pay the piper (or the lawyer, accountant, consultant, or anyone else who bills for time), momentem can produce a report on the screen of your BlackBerry or as an Excel spreadsheet document that you can e-mail to a computer for further processing. Evernote is a BlackBerry and Web combination that’s intended to help you keep track of thoughts, notes, images, and files in a manner that doesn’t rely on a rigid structure. Just make your note — or clip it from a Web page or another app — and save it to your Evernote account. Then later, when you want to retrieve that gem of an idea or that snippet of data or that photo of a business card, just search for it in your freeform file cabinet by using tags you applied or words within the note. 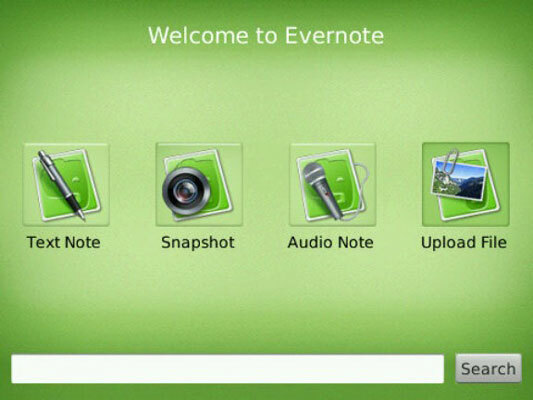 Evernote does all the heavy lifting on its own servers. It can read printed and even handwritten text within images; snap a picture of your notes or a business card or datasheet; and allow the program to read it, categorize it, and make it searchable. Expense Manager offers very few surprises — just a capable specialized database that you can easily keep up to date. 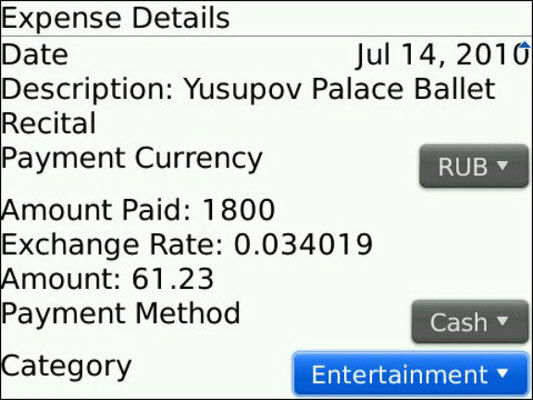 The application allows you to create multiple accounts — for example, one for business and one for personal expenses. Or you can create accounts that are tied to a specific projecte. 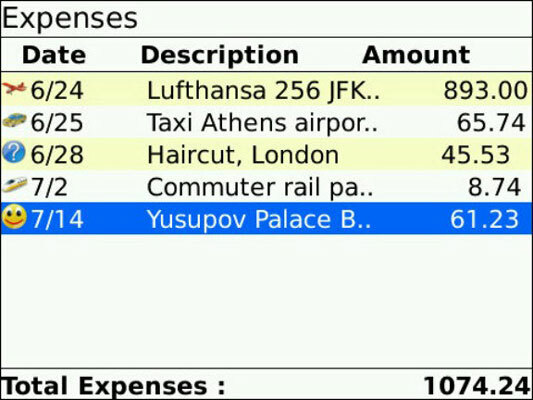 At any time, you can go to a report screen on the BlackBerry and look at your expenditures, sorting them by date or amount. You can open an entry and read the description you put in for each record. And then you can export the records that are being held in the app. Nice Office is a nice idea — one that bears watching as it matures as a BlackBerry app. Basically, it’s meant to serve as an electronic gofer, a service that keeps track of all the activities you perform by using your BlackBerry in an effort to help track your billable time and understand better your personal productivity. Secure Web site that holds a copy of your calendar, contacts, and other files. The Nice Office app for your BlackBerry that exists mostly as a manager for the synchronization process. A very active service that communicates from your phone to the Internet by e-mail. 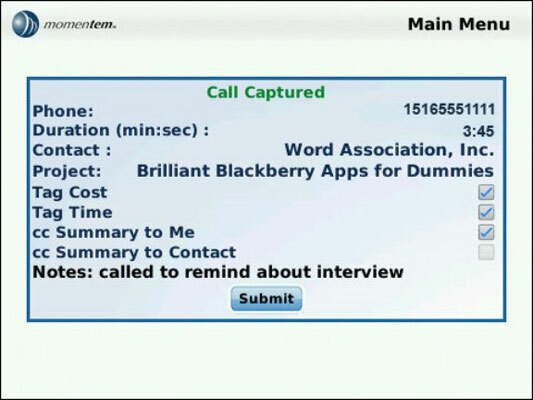 Vlingo uses speech recognition technology; you give your BlackBerry an instruction, and the words are sent over the datastream to a computer that attempts to decipher it and execute your command. The technology is pretty advanced, but there are many variables: the quality of the signal, how clearly you speak, background noise, and the complexity of the command. The standard setup for Vlingo reassigns the left side button on your BlackBerry as the command key. Press and hold it for a second to make the app display a message on screen that it’s listening. Say your piece, let go of the button, and wait for a response. 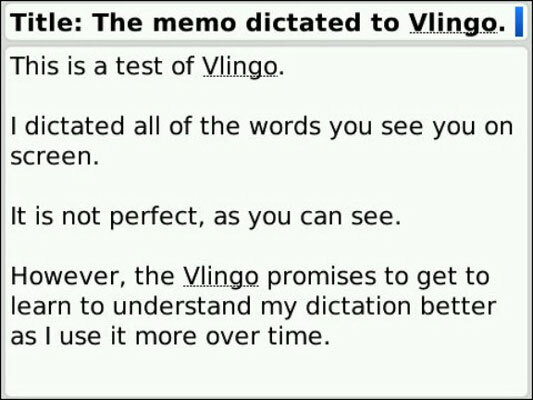 Vlingo shows on-screen the words it thinks you said. If the app has heard you correctly, you can go ahead and complete the action. If it is not correct, you can fix the command on-screen and then proceed. Vlingo for BlackBerry is currently implemented for English only. It is particularly optimized for speaking styles native to the United States and the United Kingdom.